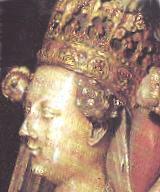 Queen Joan was the second wife of Henry IV (1399-1413) of England. She was born the daughter of Charles II (the bad) of Navarre and Joan of Valois. Her grandfather was John (the good), King of France (the second King of the house of Valois). The Hundred Years War which ran from 1337 to 1453, was the dynastic struggle for the throne of France between the English Plantaganet dynasty and the French House of Valois. With both houses claiming the French throne. Henry IV had seized the throne of England from Richard II in 1399, and married Joan in 1403. You would think such a link between the royal houses would help to bring about peace- it didnt of course- it never did! She ruled as Queen of England until her husbands death in 1413. Her step son Henry V accused and convicted her in 1419 of witchcraft. Following a four year spell in Pevseney Castle she spent the remainder of her time living in Nottingham Castle. There she seems to have assumed some of the rights of the Keepership of Sherwood Forest during that time. Back in the times of Hereditary Keepership, the De Caux and D'Everingham families, based at Laxton Castle, had had a number of rights through their office, which they held from Norman times until 1287 (see Women Keepers of Sherwood Forest entry), when the keepership was lost by Robert Everingham for poaching. Amongst these right and privileges, was the right of Chiminage - the right to collect taxation from carts travelling through the forest (see Road tax entry). 'Johanna, Regina Angliae , per Galfridum Kneton, et Robertum Clapam, attornatos sous, queritur de Thoma Bayle, de Notingham, [de placito] debiti vjs. viijd'. 'Joan, Queen of England, by Geoffrey Kneveton, and Robert Clapham her attourneys complains of Thomas Bayle of Nottingham, [of a plea] of debt of 6s 8d'. In fact he refused to pay her it.. and so she brought a claim to the court for the money. The claim presented that a Thomas Rothewood withheld from Queen Joan and Geoffrey Kneveton the rents from the hambling of dogs within the Forest of Sherwood (pro redditu expeditationis canum infra Forestam de Shyrewode). It is claimed in the case that Thomas owed 12d for the rent. Her counterpart in these claims is one Geoffrey Kneveton- who was actually Constable of Nottingham Castle. 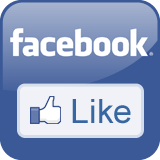 Unfortunately there is no follow up to the case, so it is not certain of the outcome of the trial. What is strange is that this is not poaching in the normal sense. These are not the Kings deer, and the butcher was not hunting with a bow. He went in to the park, broke the park pale (three metre high fence) down, and stole four pigs who were grazing within - using a club. The pigs were grazing in the park legitimately under the pannage system. Pannage was a common right for peasants who were allowed to graze their pigs in the woods of the forest when the acorns fell and for a period of time after. 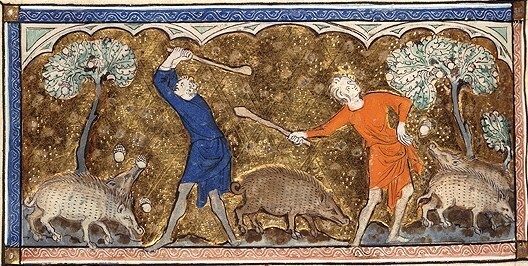 This season was decided at the Verderers Court (see Forest Law page for more details) and the numbers of pigs were monitored by Agisters who acted as tax collectors. This entry shows that with the demise of the Forest Eyre Courts by the time of 1440 (see 1287 Sherwood Forest Eyre Court and 1334 Sherwood Forest Eyre Court entries); how breaches of the forest law were dealt with. The Keeper of the Forest here brought complaint before the Nottingham Court to gain the money back from the accused, caused by the trespass and damage to the park. Ralph Cromwell was Keeper of Sherwood Forest and Constable of Nottingham Castle as appointed by King Henry VI in 1437. He held land and a manor house at Lambley- and may also have been the man for whom the Belvoir Map of Sherwood Forest was made (see Oldest map of Medieval Sherwood Forest). In 1194 Richard the Lionheart gave a licence to hold tournaments to five locations in England. Interestingly for our story one of those was at Blyth in Nottinghamshire. In the 12th century when this royal Licence was granted Blyth was within the Royal Forests of Nottinghamshire. King Richard had to bring about this act because his father Henry II had made tournaments illegal. He saw them as a source of disorder. Bunches of heavily armed testosterone fueled young men running around armed to the teeth was not regarded as a sensible idea by Henry II: desperate to restore order to England after 20 years of civil war. Unlike his father, King Richard I saw the tournament as the best way to train men for combat. They rapidly became a method for skilled and ambitious men to become rich and famous, and tournaments were held across the continent. 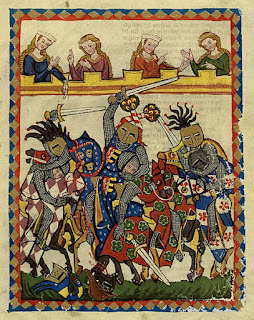 The original tournaments were based on the melee, where large numbers of knights would fight as individuals or in teams- on horse or on foot. This meant plenty of money could be made by the would be champion. Perhaps the greatest Knight of his age, William Marshall the later Earl of Pembroke- rose through the ranks at the tournaments to become firstly the tournament captain for Henry II's son (Henry the Young King), then after winning his fortune around the tournament fields of France and England he managed a short spell on crusade in the holy land, became the trusted servant and general of King Richard I and King John, before being made Earl of Pembroke and then the Regent of England for the young Henry III in 1216. In this role he helped defeat Louis of France who had made claim to the English throne- leading the charge at the 2nd Battle of Lincoln in 1216 aged in his seventies. He oversaw the sealing of the Magna Charta in 1215, and then brought into being the separate Chater of the Forest in 1217- that would have a great impact on the boundaries and rules of Medieval Sherwood Forest (more soon). Quite a life by anyones standards! He became a Templar Knight on his deathbed and is buried in the Temple Church in London. It was the opportunity of the tournament field that gave him his start on the road to greatness. It was a road that through Magna Charta, and the subsequent Forest Charter would have a great impact on Medieval Sherwood Forest (more soon- see boundaries page for some information). 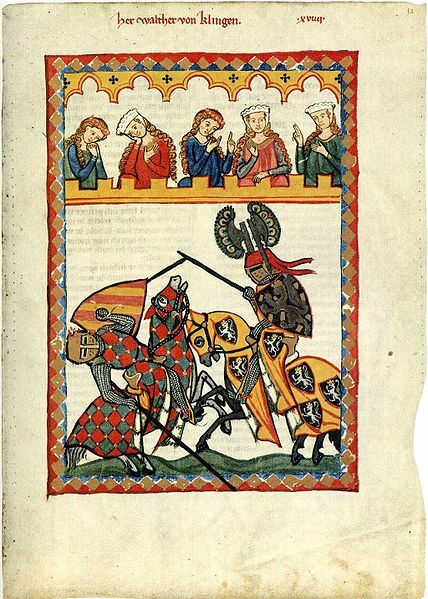 These original tournaments became the testing ground for Knights across Europe. The tournament melee could seem a disorganised affair- but in the hands of such tournament captains’; great skill and ingenuity was employed to bring glory on the field. Melees were incredibly violent, and injury a likely occurrence- William Marshall’s helmet was so badly dented on one occasion he could not take it off. When they wanted to present him with his prize he was eventually found with his head on the blacksmith’s anvil having the dents beaten out of his helmet by the blacksmiths hammer; so he could remove it!!! (Jones 2007). In the forests of Nottingham it was at Blyth in these earlier days that these tournaments were held. Blyth was in the Hatfield District of the Wapentake (Hundred district) of Bassetlaw in North Nottinghamshire. An expanse of natural heath (Hatfield means heath field), it was an area obviously suited to a royal forest. Blyth was in the forest by at least 1100, and remained so until 1218. It may have been in the forest since soon after the conquest, but the boundary at that time is not fully known. Blyth belonged at Domesday to the great baron Roger De Bully whose land holdings were based on the castle of Tickhill about four miles to the north. This grouping of lands was therefore known as the ‘Honour of Tickhill’. These lands defaulted to the crown in 1100 when Roger’s successor Roger Belleme fought on the wrong side during Henry I’s campaign to regain his Norman possessions. With the honour of Tickhill in crown hands forest law seems to have spread over the area. The Historic Environment Record (HER) for Nottinghamshire lists ‘Raker Field’ to the south of the village of Styrupp near Blyth as the tournament field- but this is disputed- certainly it would be small- as melee fields could be up to three miles across. ‘A level tract of land between Blyth and Styrrup was the locality where feats of horsemanship took place, in which the flower of English chivalry sometimes under the personal patronage of royalty itself. We can well imagine the animated scenes that must have occurred at these war-like gatherings... Many allusions are made in the Close Rolls to the Blyth meeting, which continued till the end of the sixteenth century, when popular taste began to change and tournaments became but a reminiscence of the past’. So it seems that tournaments at Blyth were a common feature throughout the period. Public tastes did indeed change, and the tournament evolved through the medieval period. Melees often started with a joust where protagonists would charge at each other in an attempt to unseat the opponent or ‘tilt’ him from his horse. Once this had happened the melee would ensue. 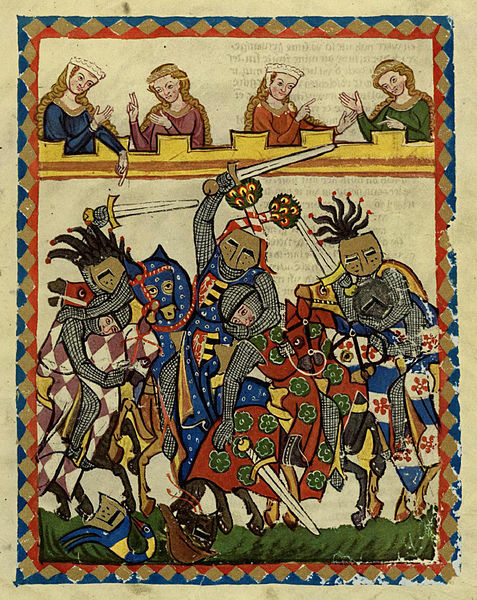 The statute of Arms of Edward I in 1292 brought in the use of blunt weapons in the tournament. By this time jousting had begun to take over in popularity from tournament fighting via the melee. The joust would take chivalrous spectacle to new levels. It is this method of contest that is the most familiar to us from the medieval tournament. In 1334 Edward III held a tournament in Nottingham in Sherwood Forest. Perhaps to tie in with the Forest Eyre court held in that year (see the 1334 Sherwood Forest Eyre Court entry for more details). ‘When the earls, barons, and a great number of ladies had gathered on the Sunday, January 19, the king gave a solemn feast and the great hall of the castle was filled by the ladies... At this great gathering there were two queens, nine countesses, the wives of barons, knights and citizens, whom they could not easily count... in tents and other places, where food and all other necessities had been prepared; everything was on a generous scale and served unstinting... In the evening dancing and various entertainments were laid on in magnificent fashion. For three days following, the king with nineteen other knights held jousts against all comers; and the king himself, not because of his kingly rank but because of his great exertions and the good fortune that he had during the three days, was held to be the best of the defenders’. Adam of Murimuth 1344 (Munby et al 2008). This description of tournament comes from Edward III’s Round Table Feast where he founded an 'Order of the Round Table' based on the legends of King Arthur. This order of the Round Table would be reduced later in his reign into the 'Order of the Garter' which survives to this day. The joust and the tournament had moved from a training place for young knights in blood thirsty melees to the height of the chivalric ideal. In Sherwood Forest the tournaments at Blyth and Nottingham were part of this embodiment of knightly virtues. Alongside the archery training and tournaments that are the stuff of the legends of Robin Hood in Sherwood Forest- the pursuit of the common freeman- (see Archery in the Forest entry for more details) there were also knightly tournaments of both the early melee and later jousting traditions in Sherwood Forest. As stated above, at Blyth there are accounts of tournaments throughout the medieval period, showing how popular this form of entertainment was to the upper echelons of society in the medieval period, and how it formed a colourful and glamorous part of the story of Medieval Sherwood Forest.